4 OZ. OR 8 OZ. BOTTLE. 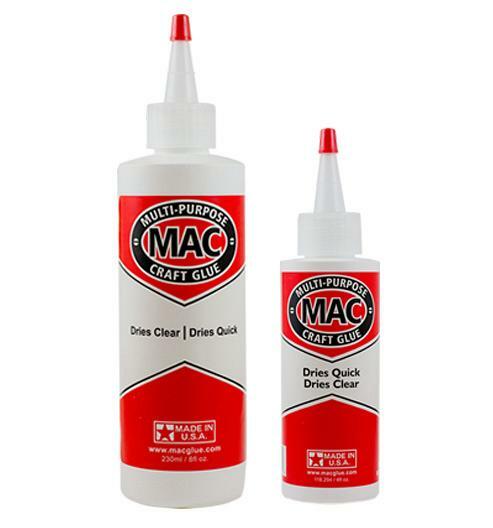 MAC GLUE IS A MULTI-PURPOSE, QUICK AND CLEAR DRYING GLUE. IT'S FLEXIBLE, CRYSTAL CLEAR, WATER RESISTANT QUALITIES MAKE IT A PREFERRED GLUE FOR GLASS ON GLASS PROJECTS BUT IT ALSO WORKS GREAT FOR VIRTUALLY ANY SURFACE TO SURFACE BONDING, INCLUDING: TILE, GLASS, WOOD, METAL, CERAMICS, LEATHER, RUBBER, PLASTIC, MOST FABRIC AND CARPET. CAN BE USED WITH OUR POLYSTYRENE SHAPES. CREATED BY A GLASS MOSAIC ARTIST. NOTE: THIS ADHESIVE HAS A VERY THIN CONSISTENCY. A LITTLE GOES A LONG WAY SO THIS BOTTLE WILL LAST A LONG TIME. 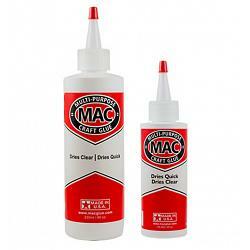 IT'S ONE OF THE CLEAREST DRYING GLUES AVAILABLE.